A recent article on The Daily Galaxy provided readers with further details about the star (Scholz's Star) which probably passed through the outer regions of the solar system just 70,000 years ago (1). The story prompted the usual grumbles about how the doom-mongering conspiracy theorists would quickly identify such an event with Nibiru, or Nemesis, etc. Hey... live with it! Conspiracy theorists sometimes get it right, after all. It's certainly possible that such an event might have caused a perturbation of the Oort Cloud, sending comets down towards the Sun from the previously stable orbits, although astronomers are not convinced that this would have been as dramatic as one might imagine (the outer Oort Cloud being extremely diffuse at this distance). It's also of great interest to note that this event happened during the near Pleistocene, commensurate with the presence of modern humans on our planet. Perhaps Scholz's star was close enough to be a significant stellar spectacle in the sky. "Astronomers have identified the closest known flyby of a star to our solar system: A dim star that passed through the Oort Cloud 70,000 years ago. A group of astronomers from the US, Europe, Chile and South Africa have determined that 70,000 years ago a dim star is likely to have passed through the solar system's distant cloud of comets, the Oort Cloud (image above). No other star is known to have ever approached our solar system this close - five times closer than the current closest star, Proxima Centauri. "The star's trajectory suggests that 70,000 years ago it passed roughly 52,000 astronomical units away (or about 0.8 light years, which equals 8 trillion kilometers, or 5 trillion miles). This is astronomically close; our closest neighbor star Proxima Centauri is 4.2 light years distant. In fact, the astronomers explain in the paper that they are 98% certain that it went through what is known as the "outer Oort Cloud" - a region at the edge of the solar system filled with trillions of comets a mile or more across that are thought to give rise to long-term comets orbiting the Sun after their orbits are perturbed. 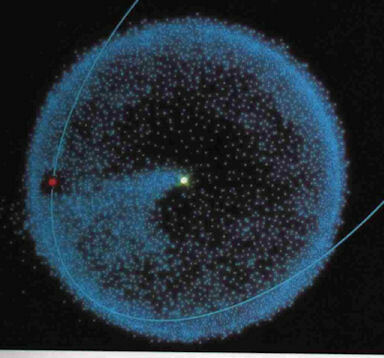 "While the close flyby of Scholz's star likely had little impact on the Oort Cloud, Mamajek points out that "other dynamically important Oort Cloud perturbers may be lurking among nearby stars." The recently launched European Space Agency Gaia satellite is expected to map out the distances and measure the velocities of a billion stars. With the Gaia data, astronomers will be able to tell which other stars may have had a close encounter with us in the past or will in the distant future. If one had asked astronomers only a few years ago whether they thought it was possible that a star had skimmed the edge of the solar system within the time period of modern humans, then I suspect they would have sneered at the possibility. Now, though, they seem open to finding other 'perturbers' out there, awaiting discovery. He has subsequently sent me this image (right, above) which he thinks might be of Nibiru. The image was taken from Microsoft on 16th May 2015, and he's been tracking this red speck's progress for a while. Neptune is currently in the constellation Aquarius (3), which is not one of the most exciting star regions in the sky. This red blob doesn't look much like a star to me - if it was, I guess it could have been Chi Aquarii (χ Aquarii), which is a fairly bright red giant. 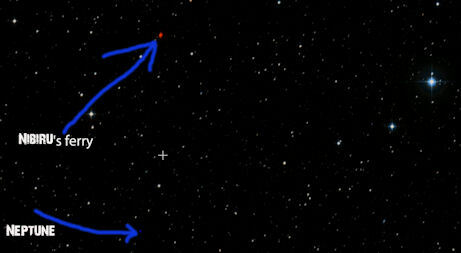 Another feature of the constellation is the M2 globular cluster, but I've not seen images of this that show it as red. As far as I can tell, there are no other planets in Aquarius (the obvious candidate being Mars, which was in Scorpius/Libra around that time). So, I can't think of an obvious explanation for the red blob, although it doesn't really look like it 'fits' with the rest of the picture, in terms of its luminosity etc. However, Lando previously sent me a better image of this object, in November last year (right, below) which is certainly more authentic in appearance. It is said to have been passing Neptune and Uranus at the time (4), so it obviously a pretty slow-moving object if it's remained in Neptune's vicinity for 6 months. Therefore, either it's way out in the outer solar system, or it's a background object embedded in the Aquarius constellation (χ Aquarii? It looks a lot more like a large red star on this image). So, the 'ferry' coordinates are for the Aquarius object that Lando's been talking about, which lies pretty much on the ecliptic in the middle of the Aquarius constellation.. Therefore, it's definitely not the globular cluster M2. 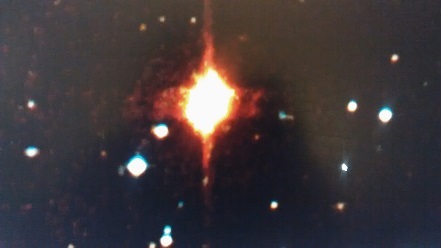 But it could be the red giant χ Aquarii, which has a magnitude of 5. 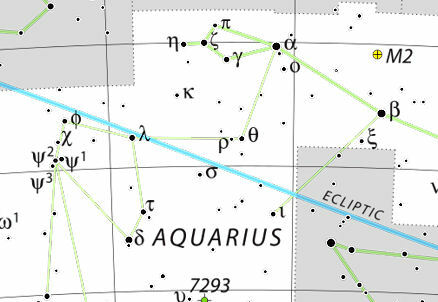 That lies to the right of the constellation image of Aquarius, just below the blue line of the ecliptic. Again, this all depends upon whether Lando's object is moving over time against the background star-field - something I'm unable to determine from the images he's sent me. So I can't rule out some kind of anomaly, but it seems most likely that this is simply χ Aquarii. As he points out, even if this is not 'the ferry', that doesn't mean it's not still out there waiting to be discovered! The phenomenon that is Nibiru is equated with the ancient symbol of the Winged Disk. For good reason, arguably: Given the cometary nature of the rogue planet that passes through our solar system's planetary zone every 3600 years or so (according to author Zecharia Sitchin (1)), it seems plausible that the solar wind emanating from the Sun would drive off volatiles from the otherwise frigid outer world as it moves through its perihelion passage. 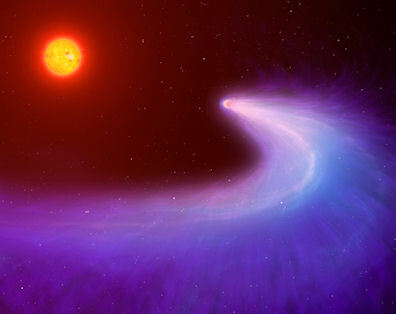 Like a comet, then, this terrestrial world, this cosmic 'ferry', would appear like a giant red comet in the sky. "... the star, which shineth in the heavens. Personally, I think that Marduk is a more powerful planet than even Jupiter, and proposed many years ago that this mysterious celestial object was actually a failed star, or sub-brown dwarf (3,4), an idea that has become an important revision to Sitchin's controversial theory over the last decade or two. The exact nature of 'Nibiru' remains a mystery. Perhaps it is simply the sub-brown dwarf Marduk passing through the solar system periodically. Perhaps it is an outlying terrestrial planet of the sub-brown dwarf system passing through the planetary zone as Marduk skims its boundaries - hence the ancient moniker 'ferry'. Either way, its appearance is not that of one of the regular planets. Instead, the 'star' appears to be surrounded by some kind of aura, or halo, swept back by the powerful solar winds to create the classic Winged Disk look. "The cloud of gas around GJ 436b, made up mostly of hydrogen, has a circular head that surrounds GJ 436b, and a tail trailing behind the planet. The diameter of the head is about 1.8 million miles (3 million km), or five times the width of the host star, which is about half that of the sun. The length of the tail is uncertain, because the research team's observations do not cover it entirely, but their computer models suggest it could be about 9.3 million miles (15 million km) long. The last paragraph of the above quoted article is important to scientists because they wonder whether the small rocky worlds found very close to parent stars began life as much larger gas giants whose gases were blown off early on in the life of the parent star. What is perhaps more interesting to Sitchinite proponents is the anomalous appearance of a Neptune-sized gas giant skimming close to a parent star. It's all the more surprising considering that the parent star is a relatively cool red dwarf. It seems likely that many more of these kinds of planets will be imaged in the future as scientists turn their attention to 'Super-Earths' and 'Mini-Neptunes' in the years ahead, aided by new powerful telescopes coming on line (6). Could this Object be Nibiru? I've been sent two very curious images from an academic astronomer friend of mine which is suggestive of a Nibiru-like object (1). He first came across the coordinates on a blog written by Christian researcher Lyn Leahz (2), who is interested in the return of Planet X/Nibiru. 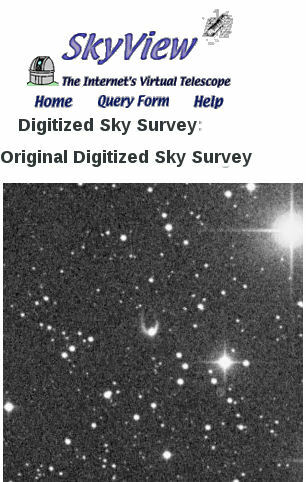 The images he sent to me (right) have come from the SkyView digitized sky survey (3) and an analogous image taken from the Aladin interactive sky atlas (4), based upon these coordinates. As my friend says, they are certainly suggestive of a Winged Disk-type object - as described in my previous blog item. "I found the coordinates surfing on Internet briefly. So I inputted them into the professional astronomical websites and I got it. It is an IRAS body, first observation in 1990. It is catalogued as a F5II star, so one a bit larger than the Sun. It could be also a reflex, because this is a collage of frames from different observations, but it is really similar to the famous winged-disk. "There are others stars in Aladin with wings, but very faint compared to this one. This object is next to the ecliptic. Next month I have access to a big telescope, I might try some shots to see the colours and compare with F-stars, for example. Looking at my star maps, this object would appear to be quite close to the Crab Nebula (M1) in Taurus (R.A: 5h 34m Dec: 22). It'll be interesting to see if the images my friend manages to take of it with a large telescope compare to the Aladin/SkyView images in terms of the apparent wings - an independent, direct observation would be able to clear up whether this is indeed an imaging artifact, or an anomaly created by knitting together the mosaic of images in the original sky survey. If we can rule out these kinds of effects, then there may really be a mystery here to ponder. 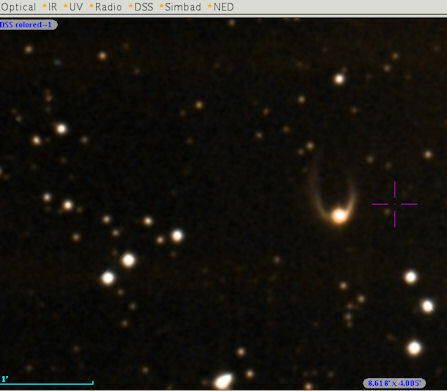 If this is indeed a closer object than the catalogue suggests (and its apparent lateral motion indicates that this is possible), then its relatively bright magnitude would suggest a substantial outer solar system body. 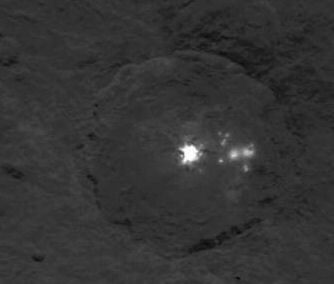 As I speculated in last month's blog, I think it likely that these lights were caused by a relatively fresh impacts clearing away a thin outer layer of rock and dust to expose ice below. Looking at this new image, I think that this remains a distinct possibility. We may be looking at some kind of peppering effect in the crater post-impact. Other scientific commentators wonder if they might be evidence of ice volcanoes on Ceres? An ice volcano is thought to exist on Saturn's moon, Titan, according to some geophysicists (4). Additionally, a network of ice volcanoes is spewing out oceanic water from the interior of the tiny moon Enceladus into space, helping to create Saturn's E-ring (5). So, there are precedents in the outer solar system for this kind of geophysical activity. 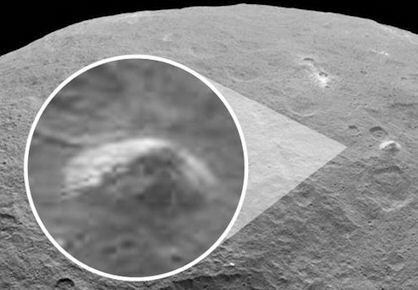 If the discovery of the anomalous 'lights' on Ceres was not enough, the appearance of an enormous, isolated 'pyramid' about the size of Mont Blanc, the largest mountain in the Alps, has set many commentators' pulses racing (6), fuelling the ancient E.T. debate doing the rounds (7). Dawn probe images taken on 14th June show a 5km-high mountainous structure with steep slopes protruding from a relatively smooth area of the dwarf planet’s surface. NASA considers it to be 'intriguing' (2). Although this curious solar cross dates from about 2400BCE, I was struck by its similarity with early Christian Chi-Rho motifs, particularly those incorporated into Graeco-Roman mosaics (3), as well as items of Etruscan-style micro-mosaic jewellery (4). 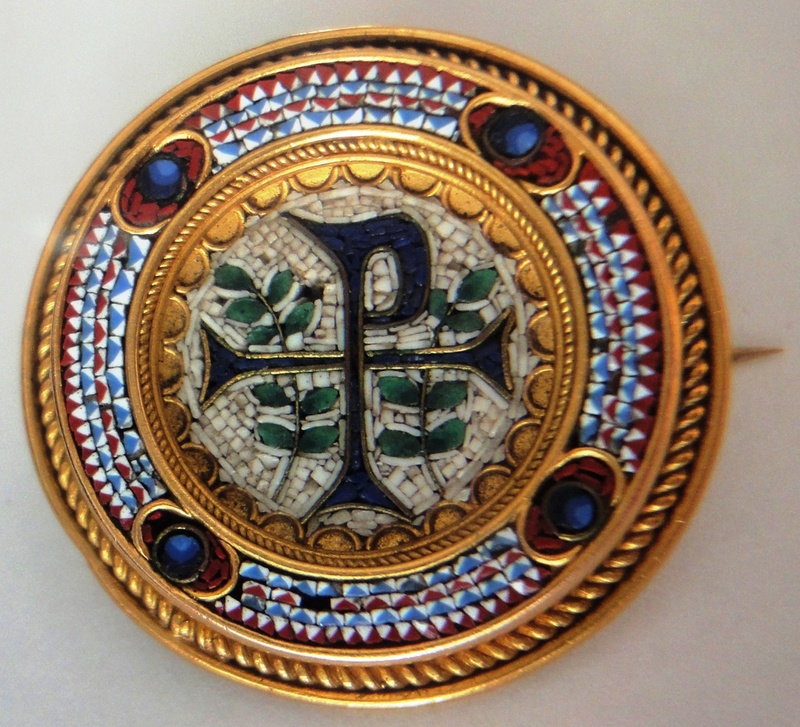 The mosaic broach shown (right) is a particularly close match to the Monkton Farleigh sun-disk. 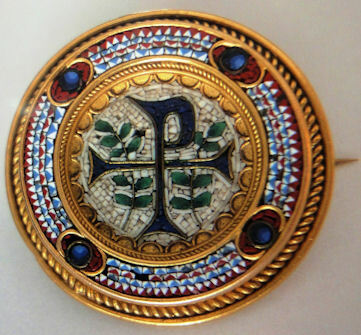 Now, this broach was likely crafted in the late 19th century by the Castellani family in a revivalist Etruscan style (4). So, the remarkable similarities between these two items are mere coincidence. Unless, that is, these are examples of an iconic symbol that finds its origin way back in the mists of time. One might readily argue that these are examples of solar symbols. 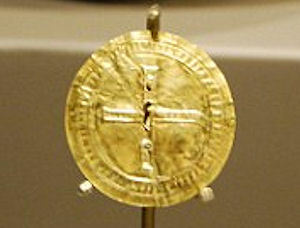 Other supposed solar symbols from antiquity include the famous Winged Disks. It also bears a strong resemblance to the Maltese cross. I've discussed similar symbolism regarding ancient Winged Crosses, bizarrely in a very popular webpage about a famous footballer's tattoo! (5) The Winged Cross symbol has ancient origins, and perhaps it is unsurprising that it forms the basis for such modern tattoo art. 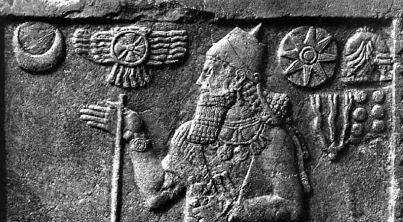 One of the finest examples of this form of symbolism is a Mesopotamian Winged Disk unearthed in 1951 in Northwest Palace of Nimrud in modern-day Iraq - the "Banquet Stele" created during the reign of Ashurnasirpal II (883-859BCE) (6). Could there really be a connection between the symbolism in this Mesopotamian stele, and the 4,500 year old gold broach dug up in the English countryside? On the face of it, this is simply coincidence. But what if there is a common factor - an important celestial phenomenon recorded occasionally in history, and pre-historically, which forms the basis for an important religious symbol spread across ages and cultures? Many of these cultures borrowed symbols and art forms from each other. Compare the Mesopotamian 'Banquet Stele' with the fourth image here, that of a sarcophagus from Constantinople circa 400AD showing the Christian XI symbolism (which, itself, is presumably a later adaptation of the early Chi-Rho Christogram) (7). 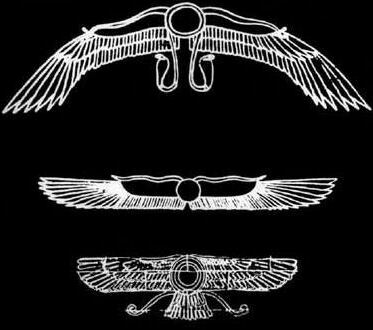 These may be angels carrying the disk symbol, but the overall effect is very similar to an Egyptian Winged Disk. Again, this kind of symbolism flows through all of these cultures, irrespective of any obvious connection they may have.